Last week, during the final warm days of autumn 2015, I went to the Beyond Tellerrand conference in Berlin “City of Design”. Beyond Tellerrand (#btconf) is a two-day event about creative web design and development started by Marc Thiele in 2010. Marc and his team created a fun memorable experience with a great variety of topics and family atmosphere. 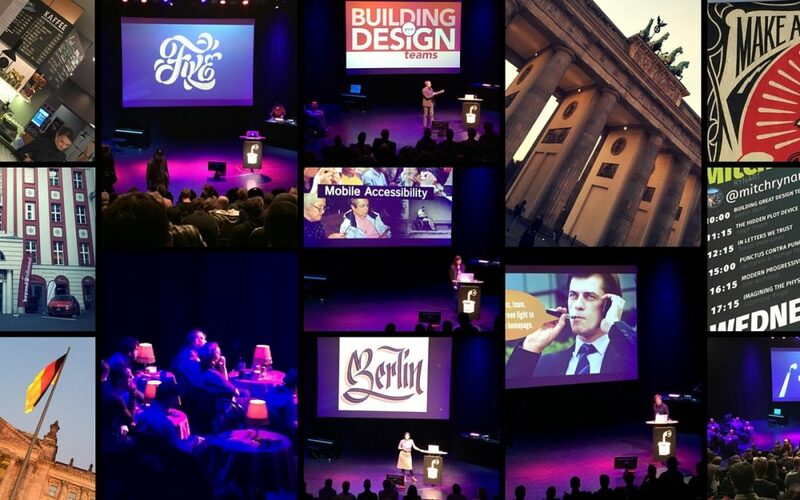 Web designers and developers from around the world gathered for a sold out event at Admiralspalast in Berlin to hear top influencers speak about the latest trends in web design and development. Each presentation was jam-packed with great advice and takeaways, making you think outside the box and look beyond the edge. Steve Souders and Mark Zeman are pioneers in the world of web performance. They started their presentation explaining how promoting a process that brings design and performance together at the beginning of a project helps deliver a web experience that is both fast and rich. They highlighted the importance that speed is more important than design and provided practical tips how to make use of W3C Web Timing Specs (Navigation Timing, Resource Timing, and User Timing). Steve and Mark shared details on this amazing tool for testing code and loading speed, called Speedcurve, which dramatically improved the performance of the Tourism New Zealand website. Key takeaway: Fast is Good – Prototype early and define the most important elements on the page when building websites. The well-known web designer and speaker Brad Frost from beautiful Pittsburgh shared his work experience and best practices for creating style guides. Brad has helped create several tools and resources for web designers, including This Is Responsive, Pattern Lab, Styleguides.io, WTF Mobile Web, and Mobile Web Best Practices. Brad talked about the importance of design systems and the atomic design methodology. He walked through the stages (atoms, molecules, organisms, templates, and pages) that power Pattern Lab, giving insight into how to create effective pattern libraries. Key takeaway: Style guides promote consistency and lay a future-friendly foundation. Make design systems that create a website. Make your Style guide attractive and visible, they are a huge recruitment tool. Martina Flor combines her talents as both a designer and an illustrator in the drawing of letters. Martina shared her process at working in Letter Design and provided the audience with a set of principles to tell good from bad Lettering. In her keynote, she gave a broad overview of the art of lettering, including defining what is lettering and what is not. Key takeaway: Sharing sketches with clients is a great way to convey ideas quickly. Marcy Sutton is an Accessibility Engineer at Adobe in Seattle and an AngularJS core team member. Marcy showed techniques to create better mobile experiences that are accessible and especially how we can use our skills as web developers to create brilliant mobile apps. She recommends baking accessibility into your interface by adding labels to ambiguous visual icons and using buttons and other semantic elements. She explained how to disable interactive elements in HTML with tabindex=”-1″ and aria-hidden=”true”. Also, she provided useful tips like not to use all capital when writing text in the source code but to use CSS text-transform: uppercase. The BBC Mobile Accessibility Guidelines is a good reference to keep in mind and applicable to every project. Key takeaway: Use semantics. Mobile accessibility IS important, and there is much to do. An over-riding trend from the conference was that there is growing interest in the Internet of Things. Google’s Scott Jenson, a UX designer, revealed a project called The Physical Web to provide “interaction on demand” so that people can walk up and use any smart devices without the need for intervening mobile apps. Scott showed us the possibilities of the Physical Web and how it will merge the physical and digital worlds. Stephanie Rieger explored the impact the Physical Web is going to have and showed examples based around a technology called Eddystone-URL mentioned in Scott Jenson’s talk. The Physical Web will be an open standard that everyone can use, and analysts are predicting explosions in connected devices over the next few years. Key takeaway: The web isn’t dying, it’s just getting started. Brendan Dawes, a designer exploring the interaction of objects, people, technology and art, showed his approach to making things; things made for himself as well as things made for clients. From hardware to software and everything in-between Brendan showed how curiosity and a thirst to learn new things drives him on to become a better maker of things. Brendan recommends just to start on the smallest thing when starting a new project. Key takeaway: Push your stuff out there. You never know what’s it gonna spark. #7 When should design be clear, and when should it be mysterious? Chip Kidd is an award-winning graphic designer and writer from New York. He has designed over a thousand book covers and his TED Talk has been viewed over 1.4 million times. Kid showed the art and deep thought of his cover designs, when should design be clear, and when should it be mysterious? He shared a lot of wisdom about the graphic design process and industry in general. Key takeaway: If you can properly define the problem, then you’ve already defined the solution as well. Aarron Walter is the General Manager of New Products at MailChimp and author of Designing for Emotion. Aarron shared his skills of building a killer design team. Aarron explained that to make great products you’ll have to build a great team first and respect is an important part of creating great work as a team. He said that to go forward, you must focus on refinement and make incremental improvements. It’s not always about the new things what you make. He recommends focusing on finding weirdos, as they have a vision of the future of your product. Deadlines are good things, according to him. When designers don’t have constraints, they feel like they’re wondering in the desert, and they don’t know what’s next. Key takeaway: Deadlines are good because they give you the possibility to celebrate your success! Steph Troeth is a user experience researcher and designer. Steph showed us that storytelling opens a world of possibilities and adds another dimension to your UX toolset. Steph showed that stories help people make better decisions and are like flight simulators for the brain. She explained that we can use UX in both research and design. Research is the problem space, design is the solution space. Steph gave us some useful examples of how to tell a story. John LeCarre famously said, “‘The cat sat on the mat’ is not the beginning of a story; ‘the cat sat on the dog’s mat’ is.” Just three simple elements character, place, and time are enough to get a story going. Key takeaway: Storytelling helps to create a better user experience. #10 How to build a business on the internet. Jay Fanelli and Nathan Peretic from Cotton Bureau shared their experiences on how (and why) to build a successful business on the internet. They pointed out some wrong and right ways to start a business, but that advice must be personal to you. Key takeaway: Go big or go home and move to Brooklyn – because your city is boring. Beyond tellerrand Berlin 2015 was an absolutely amazing experience. From the inspiring speakers to the venue and DJ Tobi mixing quotes from the talks, fantastic conference and well-thought-out. Many thanks to the Beyond Tellerand team and NLHTML5 for arranging the tickets! What do you think? Were you there? What were your biggest takeaways from the conference?